MOSCOW (AP) — Mixing wry jokes with economic statistics, Russian President Vladimir Putin sought to reassure the nation during his annual marathon call-in TV show Thursday, promising that its troubled economy will rebound and vowing to make other countries reckon with Russia’s interests. Putin answered questions from adults and children from around the country during the highly scripted event, which he uses to burnish his image as a strong leader who protects Russia from foreign threats and cares about ordinary people’s needs. In the days ahead and during the show, Russians sent more than 3 million questions to Putin, ranging from bread-and-butter troubles at home to the situation in Syria. Asked about Russia’s strained ties with Turkey, Ukraine and some other nations, Putin said Russia was ready for friendly ties with all nations but would retaliate against any hostile moves. 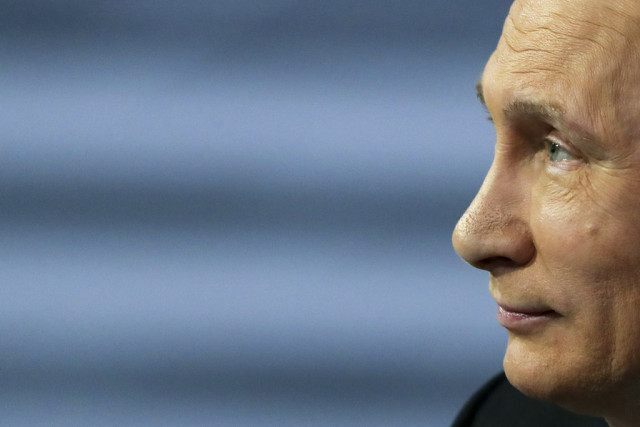 “We must respond, or otherwise they will sit on our neck and whip us up,” Putin said. He said the United States must learn to respect Russia’s legitimate interests. Putin told viewers that Russia has shored up the Syrian army to the point where it can conduct offensive operations despite a Russian military drawdown, pointing to the Syrian forces’ success in recapturing Palmyra from the Islamic State group. The Russian leader also voiced hope that the truce brokered by Russia and the U.S. will help the Syria peace talks in Geneva go forward, paving the way for a new constitution and an early election. Russia-Turkey ties worsened dramatically after a Turkish jet shot down a Russian warplane at the Syrian border last November. Putin responded by halting the sale of package tours to Turkey and banning most agricultural imports from Turkey. Putin acknowledged that Russia’s economy remains in recession, but predicted Thursday it would begin growing again next year, noting that agriculture production was rising. Russia also has banned most agricultural products from Europe in response to Western sanctions over Russia’s 2014 annexation of Crimea and its involvement in the Ukraine conflict. In response to a question about inflation from a Moscow woman who complained that her weekly grocery bills have doubled, Putin said the counter-sanctions would eventually help the Russian economy by promoting domestic production. Putin said the uproar about the Panama Papers, the documents about offshore accounts leaked from a Panamanian law firm, was designed to weaken Russia. He reaffirmed that his cellist friend Sergei Roldugin, the alleged operator of billions in offshore assets, has spent his own money to buy rare musical instruments. They included a 1732 cello made by Stradivari, Putin said. The president rebuked the regional leader of Chechnya, Ramzan Kadyrov, who has branded Russian opposition activists as traitors and enemies of the people. “I hope the leader of Chechnya and other leaders of Russian regions will be aware of the degree of their responsibility … and will come to realize that to act and to formulate their attitude to opponents in extreme ways will not be helpful to political stability, just the other way round,” Putin said. Last month, Putin nominated Kadyrov for another term in office, shrugging off demands for Kadyrov’s dismissal over his alleged role in the killing of a Russian opposition leader, Boris Nemtsov. Kadyrov has rejected opposition accusations of involvement in the killing. Putin, 63, said he was quite content with his current status and said he and his former wife, Lyudmila, have remained friends. “We probably even get along better than before,” he said, avoiding comment on media reports that his former wife has re-married.